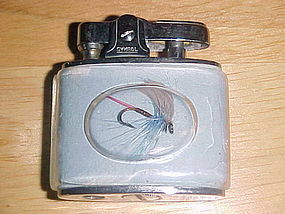 1950's - 60' pocket cigarette lighter with real fishing fly under lucite. 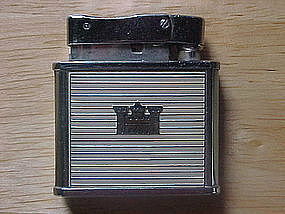 This lighter is in fine working order and would make a great gift for both fishing tackle and cigarette lighters collectors. 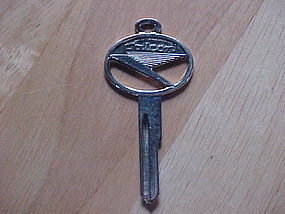 It measures 2" long x 2" high. Occ. 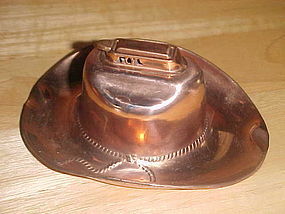 Japan table cigarette lighter shaped as a Cowboy hat. 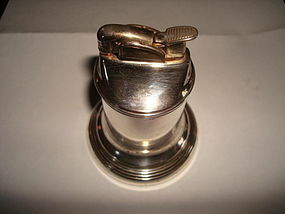 This lighter is in fine working condition with minor blemishes to the copper finish. It measures 4 7/8" long, 4 1/2" wide and 2 3/8" high. 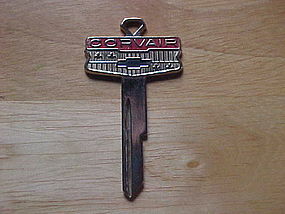 A hard to find example of OJ lighter. 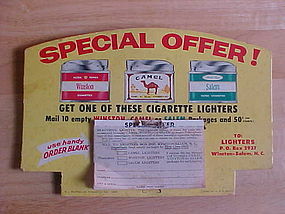 Super tin litho advertising display for KOOL Cigarettes. 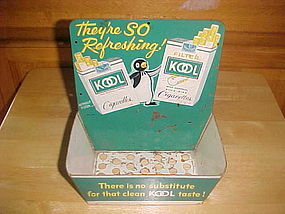 It features the KOOL Penguin holding both a pack of non filter and king size filter KOOL cigarettes. It measures 8 1/8" high and 7 3/4" wide and the holder box extends 4" from back to front. This item is in very good condition, the pictures shows a few scratches and rust sports but overall a great display piece!!!! 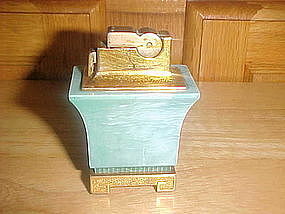 Beautiful marblelized turquoise and gold toned table cigarette lighter. 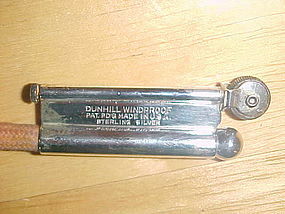 This lighter was made by the A.S.R. 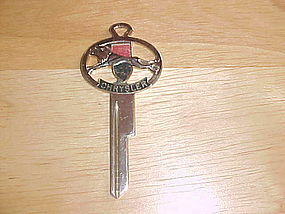 Company of Brooklyn, New York and has a patent number that dates from June 24, 1947. 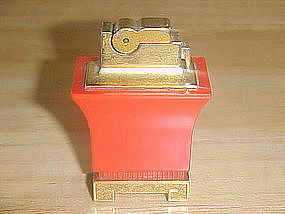 This lighter is made from vintage plastic and brass. 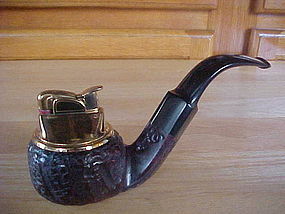 It measures 2 5/8" high and 1 7/8" wide and is in Very fine condition!!! It has an Asian influence design. $ 35.00 - "SOLD" - THANK YOU! 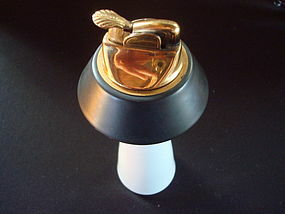 Beautiful vintage fancy table cigarette lighter. 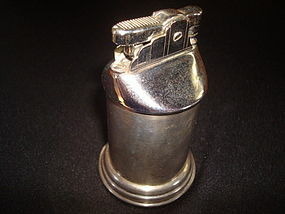 This vintage lighter was made by the A.S.R. Company of Brooklyn, New York. 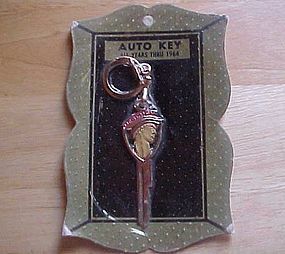 It's patent number dates to June 24, 1947. 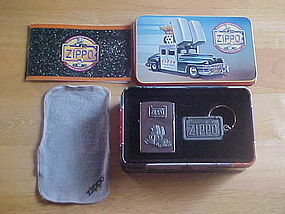 This lighter is in very fine condition and measures 2 3/4" high and 1 7/8" wide. 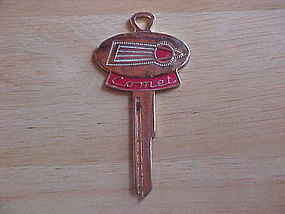 It is made of brass and red vintage plastic and has an Asian influence design.